‘Yellow Jessamine’ is a fast growing long flowering evergreen climbing plant with attractive yellow flowers, great plant for a sunny position. Commonly called the Carolina Jasmine or Yellow Jasmine it is a fast growing plant. In cooler climates, this is a plant that comes into its own in spring, masses of yellow flowers. In warmer areas it will flower nearly year round. 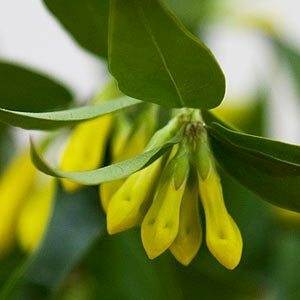 Used in the garden as a screening plant on fences, or allowed to scramble through trees and shrubs, this is an attractive twining climbing plant with bright yellow tubular or funnel shaped flowers. Although the growth rate it is reasonably fast, it does not seem to be one of those climbers that smothers other plants. It tolerates frosts, and if you are lucky you may find the double flowering form for sale. All parts of the plant are poisonous to humans if eaten. The sap can be a skin irritant. The flowers are fragrant and G. sempervirens is often planted close to decks and outdoor living areas where the fragrance can be best appreciated. This is a climber that can be used in smaller areas, it can easily be grown in containers and pruned to maintain shape and size. Gelsemium rankini or ‘Rankin’s trumpetflower’ is also known as the ‘Swamp Jessamine’ and is the rare Double Blooming Carolina Jessamine. Easily propagated from cuttings taken in spring. Cuttings are best dipped in hormone rooting powder and then grown on in a open propagating mix. Keep the cuttings moist by mist spraying until you see good signs of new growth. Height – This is a climbing plant that can reach to 4 metres. Position -Full sun to a little shade. Foliage – Mid green, leaves are lance shaped..
G. flora plena is a double flowering variety.